Oval shaped penthouse apartment on 11th floor with suspended ceiling (plasterboard). Nearly all pipes, AC units & cables laid on top of suspended ceiling and the entire apartment is full of spot lights. between suspended ceiling and roof there is between 40cm and 2.2m height. Width (min): 8-14mQuestion: How best to convert this space into a usable loft space? 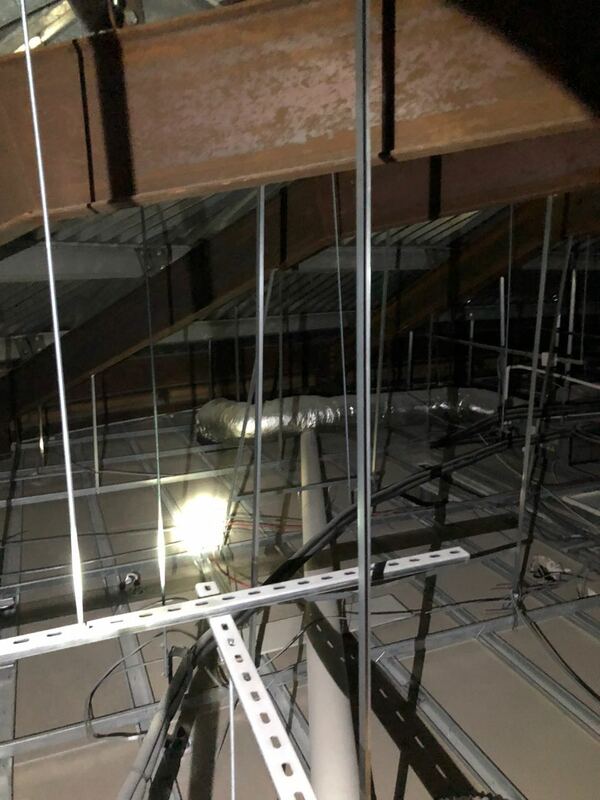 -Place beams from one end of the apartment to the other and attach the suspended ceiling to the new beams, thus removing the existing rods currently in use. ---This has proved to be VERY expensive as it means getting 14m long beams made/delivered, taking out sections of the roof and using a crane sliding the beams in. ---can the walls support the weight of your typical storage in loft spaces? ---The longest section without walls is above the living space which is up to 12m long and up to 8m wide. As such this idea may be impossible. ---how thick, how large and what material to make the floor boards? ---How to suspend it? One could drill four holes into each floor board and use 4 metal rods to suspend each board to the ceiling. Obviously the fewer suspensions needed the better as every single one will be "in the way". PS: We were planning on cleaning up the cables a bit as it's a bit of a mess, and also put in insulation between suspended ceiling and suspended floor. I'd be really interested what you guys come up with. We've been pondering solutions for quite a while now and before we decide, I thought it might be wise to hear what you all have to say. Last edited by cymode on Sun Feb 25, 2018 6:46 pm, edited 3 times in total. were initially designed for! I am sure that they were never designed to include the additional weight of a suspended floor with all the additional loadings that that implies. The first action should be to approach the Structural Engineering company who were responsible for the design when the building was built. A structural engineer already had a look at it. The steel beams are way over-engineered. They can easily hold a lot more than the maximum weight one could place in this loft space. The apartment opposite uses the same beams as the foundation for another apartment placed on top of it. At the engineers visit, did you ask him for his solution to your problem/proposal? yep, he's strongly for option 1 as it would allow for the roof to come down in 10 years and a second apartment to be built on top. I find that way to expensive for a "what if" scenario. Especially as the cost of the other options are negligible compared to those huge costs of adding another level!